Here’s what you need to know about Windows 10's system requirements. 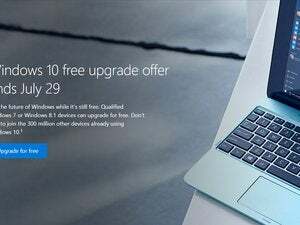 Although Microsoft is offering free Windows 10 upgrades until July 29 for all consumers running Windows 7 or higher, some machines won’t meet the spec requirements, especially if they’re older and have already upgraded from a previous operating system such as Windows XP or Vista. Here’s everything you need to know about whether your PC is cut out for Windows 10. This section should tell you whether your PC is fully compatible with Windows 10. For more information on the compatibility report, see this Microsoft help page. To find out your PC’s CPU and RAM in Windows 8, search for System from the Start screen, then select the System menu. In Windows 7, head to Control Panel > System. As for your graphics specs, open the Run command (Windows key + R), type dxdiag and hit Enter. You’ll find DirectX version and WDDM driver under the “Display” tab. The spec sheet doesn’t tell the whole story. Microsoft notes that “driver and firmware support, application compatibility, and feature support” could all affect whether a PC can upgrade to Windows 10. Again, the Get Windows 10 app and the installation process should alert you to any potential problems. You can also contact your computer manufacturer about any upgrade eligibility or other issues. Microsoft’s OEM and vendor index provides support page links, email addresses, and phone numbers for just about every PC maker you can think of. One last thing to keep in mind: Even when an old computer meets the requirements on paper, it may not perform well enough in practice. If Microsoft is withholding the upgrade, it may be doing you a favor.